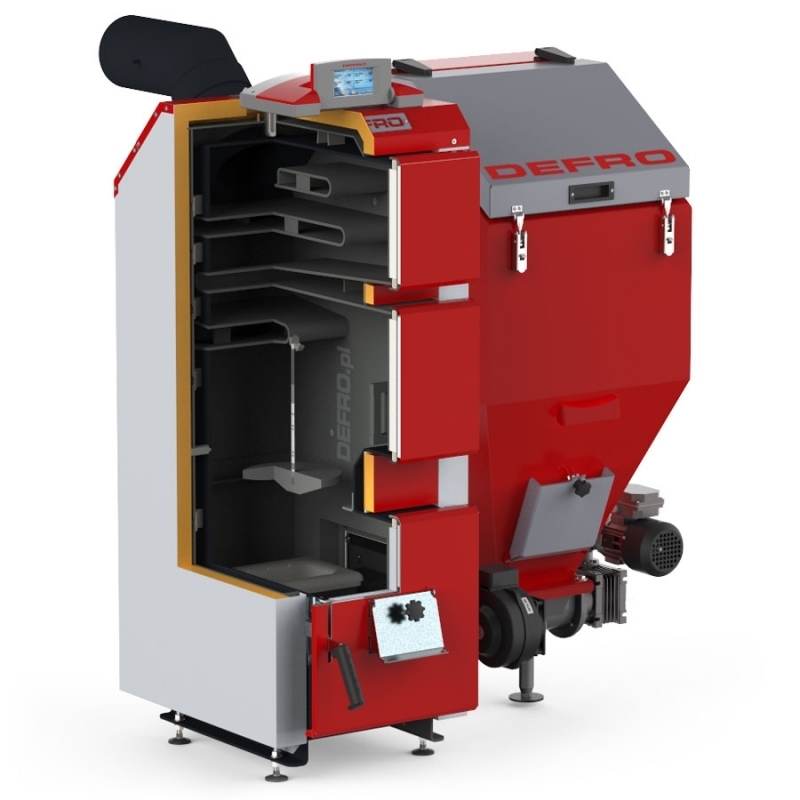 Automatic boilers KOMFORT EKO PZ ensure high servicing comfort with low operation costs. They are equipped with automatic system feeding fuel to furnace chamber and highly effective retort burner of II generation. Design of burner nozzle and use of new fuel feeding system allows using fuels of better sinterability. Developed, but friendly control system ensures that servicing comfort can be compared with boilers using liquid and gas fuels. Fuel feeder can be installed in the KOMFORT EKO PZ boilers on both sides. Moreover- boilers are equipped with substitute cast-iron grate allowing periodical combustion of the other fuels and use of equipment in the emergency situations. Heat exchanger of boilers is made of certified boiler steel of thickness 6mm. In addition, flue extension with adjustment of flue gas draught is standard equipment of the boiler. 2 Fuel tank capacity for charging density 0,8 kg/dm³. 3 Boiler weight depends on the equipment. 4 Height of boiler can be additionally adjusted by means of provided levelling legs. Legs regulation varies from 38 to 50 mm. 5 Extra paid option, installed on the customer’s request. NOTE! Please specify side of the container (left or right) during ordering of the KOMFORT EKO PZ boiler.